After you have decided on, and purchased the type of wood you will use, it is time to lay out and cut the parts. 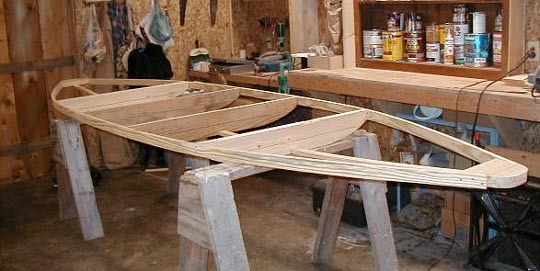 Use a table saw to rip the 2 gunnels and the keel. If you don't have a table saw, ask the lumber yard where you purchased the wood to rip them for you. If they can't (or won't) then you may have to rent one from a local tool rental center. The KARA construction plans state that you will get two gunnels 1 7/8 inchs wide, and one keel 1 5/8 inches wide from a standard 1X6. This is probably true if you use a thin kerf blade. If your saw has a thick kerf, or a carbide blade, you will probably only end up with a 1 3/8 or 1 1/2 inch keel. In my opinion, it doesn't make a lot of difference if the keel is a little narrow. 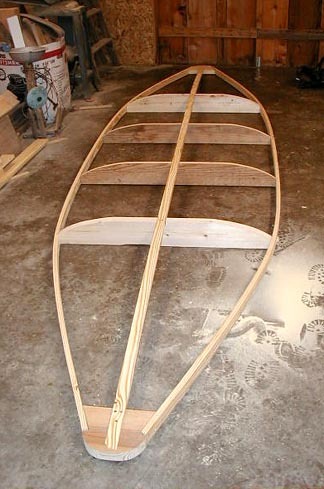 Just make sure that you cut the notches in the bottom of the ribs the right size to accommodate the keel. Next, cut out the ribs and the nose pieces. You may use a jigsaw for this step, but a bandsaw will give you a much straighter cut. Don't forget to make the plunge cut for the cockpit before you assemble the boat. It will save you a lot of knuckle busting work later! Now you can screw the ribs, gunnels, and keel together. Make sure that the flat part of the rib is even with the gunnel. If you have done everything correctly, your new boat should look something like this. 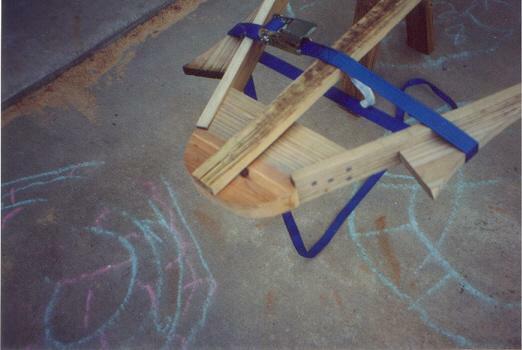 This is the boat right side up on sawhorses. And here is a little trick devised by Gary Morrison, that will make that difficult bend at the nose easier to make! 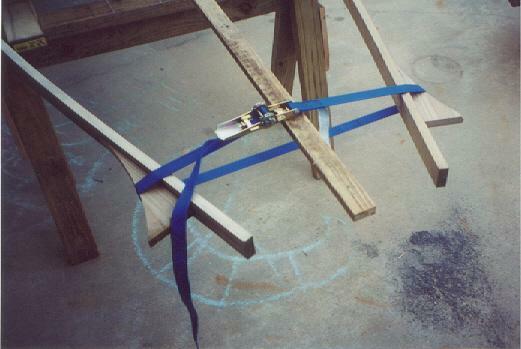 Temporarily attach two wooden scraps to the gunnells to keep the strap from sliding forward.